blow somebody away: to surprise or please someone very much. That movie will blow you away. blow (something) out: If a flame blows out, or if you blow it out, it stops burning because you or the wind have blown it. Emma blew out the candle. blow over: If a storm or an argument blows over, it ends. The force of the wind nearly blew me over. 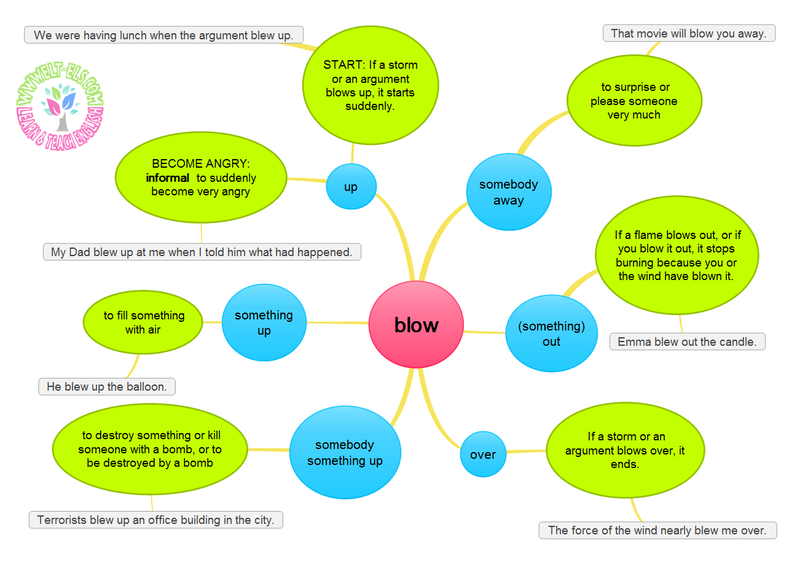 blow up: START: If a storm or an argument blows up, it starts suddenly. We were having lunch when the argument blew up. blow up: BECOME ANGRY: informal to suddenly become very angry. My Dad blew up at me when I told him what had happened. blow something up: to fill something with air. He blew up the balloon. blow somebody / something up: to destroy something or kill someone with a bomb, or to be destroyed by a bomb Terrorists blew up an office building in the city.